The object of "Saddle Broco Busting" is to stay on the horse for eight seconds. Photo from Wyoming Travel & Tourism Website. Many states hold annual state fairs with carnivals, rides, games, and cotton candy. Wyoming holds a state fair every summer that features both a traditional carnival and a rodeo. 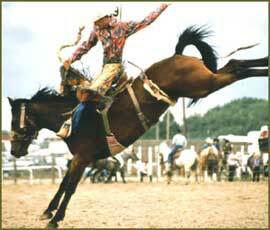 Wyoming is nicknamed the Cowboy State and is well known for its rodeos. One traditional rodeo event is Saddle Bronc Busting, where a cowboy attempts to ride a bucking horse for at least eight seconds. This dangerous activity is much more difficult than it looks and most cowboys fall off the horse before eight seconds pass. Other rodeo festivities include a pig and mud wrestling contest, the Miss Rodeo Wyoming contest, and a variety of livestock shows where animals are judged on their health and appearance. The Wyoming state fair, like many state fairs, seeks to highlight the accomplishments of high school students from around the state who have honed their agricultural skills. Students participate in Future Farmers of America and 4-H clubs throughout the year in order to learn how to raise crops and livestock. Both clubs prepare students for future careers in the agricultural industry through hands-on educational activities. Club members participate in crop and livestock competitions at the state fair. Award-winning students can receive scholarships and statewide recognition for their outstanding entries.